There’s no point denying it. We’re in Arco. And so two Italians in the running for the Youth B World Champion title cannot leave the home crowd indifferent. Also because the first, Filip Schenk, dominated the first two heats. And the second, David Piccolruaz, had made an astounding comeback in the Semifinals, from 19th to provisional 3rd. Both come from Santa Cristina Valgardena. Both are natural climbing talents. Today’s their big chance, but they both know that what they’ve done so far counts for almost nothing. Everyone starts with a clean sheet, and in these Finals the Italians are joined by Russia’s Nikolai Michurov, Japan’s Keita Dohi, Belgium’s Lukas Franckaert and Columbia’s Juan Diego Romero Salguedo who – provisional second – is the absolute revelation of this competition. The first problem is one of those you’d never want to have to deal will. It’s that ‘infamous’ red slab. That demands total balance and complete control of both the body and mind. Not ideal for the inevitable excitement that builds up prior to such an important competition. The first three to tackle it (Michurov, Dohi and Franckaert) fail to climb past the bonus hold… Then it’s time for Piccolruaz. in the Semis the Italian had failed on this hurdle and here, now… he failed to top out. The start if almost exclusively a game of delicate footwork, followed by an ascent towards the seemingly unreachable final hold. Romero Salguedo tries and tries again, but he too remains empty-handed. But then Schenk takes the stage. And just like the others, he seems to stand no chance… But only for two attempts because, on his third go, he miraculously places his foot above his head to rock over sky high and reach the top. His start can’t be better. Now it’s time for problem #2, the overhanging kingdom with a dyno to an ultra slopy sloper. Power is needed here, and also total body control. Everyone gives it their best, including Piccolruaz (who gets close to the penultimate hold), but no one manages the send. Not even Romero Salguedo who remains in provisional last place. That is, until Schenk comes and, on his 4th attempt, solves the riddle. By sticking that exit hold that had eluded all the rest. Today seems to be Scheck’s day, simply unstoppable. But, so as not to bring about some bad luck, no Italian dares make any comments. But they keep their fingers crossed. What is certain is that, seeing that all others have no tops, if Schenk sends #3 he’ll be crowned World Champion. Yes, that 3rd problem, the same one (overhanging and up the holds that resemble a climber) that none of the Junior women had managed to send. And the male athletes fare no better, the top remains elusive. 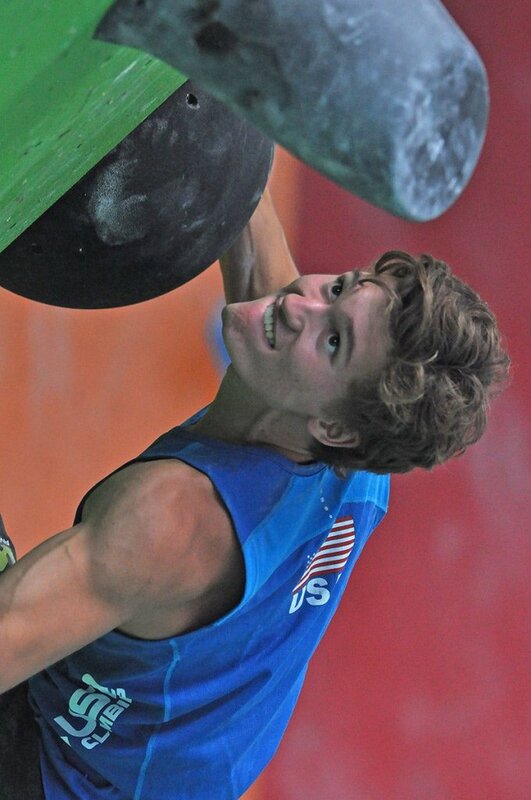 So with 1 boulder remaining, Filip Schenk with his 2 tops vs 0 is already Youth B World Boulder Champion. The first gold medal for Italy in these games! That joins the bronze won by Asja Gollo this morning in female Youth B. But it isn’t over yet. The 4th problem proves decisive for the other podium positions. All still stand a chance, even Piccolruaz. 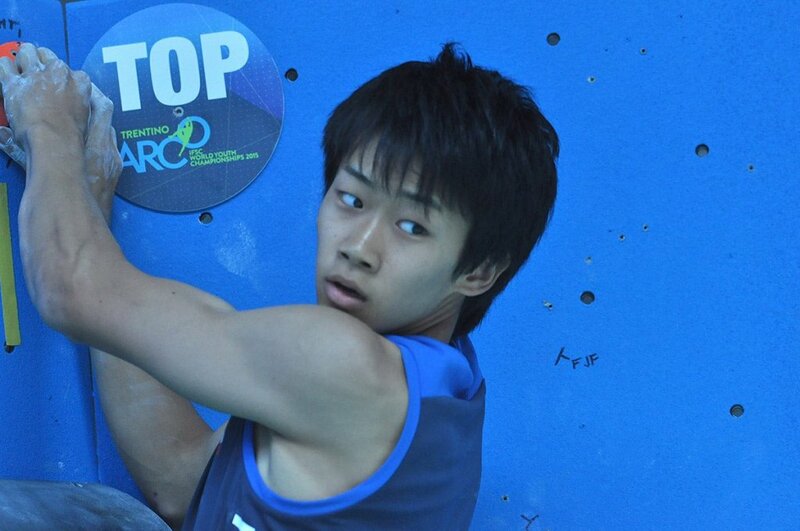 But it’s Japan’s Keita Dohi who makes a serious bid for silver by reaching the top first. No one manages to repeat his performance, until (by now you know the story) Schenk arrives. And produces a little masterpiece, flashing #4 with some impeccable technique. It’s the icing on the cake and, at the same time, the hallmark of this great champion. Keita Dohi celebrates his World Championships by finishing second, ahead of Belgium’s Lukas Franckaert who takes bronze. David Piccolruaz finishes 5th while Columbia’s Juan Diego Romero Salguedo places 6th. It seems as if there’s no rush to finish the final act of the Youth A Boulder. Better still, that’s the impression the spectators are given when watching Belgium’s Arnaud Ansion who sends, in 7 attempts, the opening problem. But the others are there, chomping the bit, ready to deal with this first test. And so one after the next they reach the top, all with a formidable flash. Hugo Parmentier gets the ball rolling, followed by Japan’s Kai Harada, America’s Shawn Raboutou, France’s Jules Nicouleau Bourles and naturally by the “winner” of the semis, Japan’s Yoshiyuki Ogata. Boulder #2 is the tried-and-tested red slab. Littered with a series of tiny white hand and footholds that lead an intricate way to the top. Ansion deals with this second go. Better than Parmentier, who needs 3, while Harada matches on the finishing hold on his second attempt. One thing is clear: he who makes a mistake in this first half of the competition risks being left behind. But no one falters: Raboutou tops fourth go, just like Nicouleau Bourles, while Ogata needs just two. At the half-way stage the two Japanese are joint-equal, even if Ogata is in the lead on countback to his Semifinal victory. Parmentier lies in provisional third with 2 top in 4 attempts. The competition becomes interesting to say the least, the World Champion title will be decided by the smallest of margins. 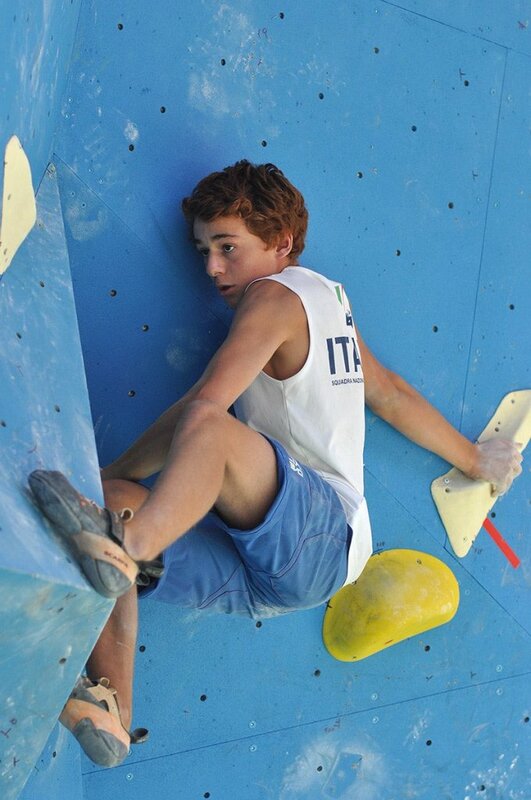 the pressure gets to Ansion on problem #3 and he fails to reach the top. As do Parmentier, Raboutou and Nicouleau Bourles. But Harada is unleashed and sends the overhanging arete in the blink of an eye, in a flash, to send his third problem. As does Ogata. So prior to problem #4 the two Japanese are perfectly parred. Were the competition to end here, then Ogata would take gold thanks to the Semifinal victory. But there’s one more problem in store, boulder #4, the same one climbed by the Juniors. Ansion and Parmentier make little headway. Harada comes out of isolation. All know that this is the decisive climb, and he sends it second go. The Japanese, tonight, is monstrous. The crowd manages to catch its breath as Raboutou and Nicouleau Bourles fall. Then it’s Yoshiyuki Ogata turn and, without waiting to be asked twice, he climbs like a rocket to flash the problem, his 4th top this evening, and become Youth A World Champion. Kai Harada (4 tops in 6 attempts, just one more than Ogata) gives Japan the historic one-two double, while France’s Hugo Parmentier (2 tops in 4 attempts) wins the bronze medal by beating America’s Shawn Raboutou by just one attempt. This too – or perhaps exactly this – is what bouldering is all about! The magnificent six Under 20 Juniors finalists are all expert athletes. They know just how important this last round is. They also know, having seen the other finals today, that (almost) anything can happen. The start is one of those that might determine the final outcome: Japan’s Tomoa Narasaki (last qualified for these finals) climbs upwards, like a juggler, pinching his way past the unholdable volumes and pyramids that pave the way. And then, voilà, with disarming ease he tops out. Too easy? It’s all relative is what Monsieur de La Palisse would say. And as it happens, Sergei Skorodumov requires 9 stubborn attempts to top out. While Slovenia’s Anze Peharc, France’s Nicolas Pelorson and Korea’s Jongwon Chon repeat Narasaki performance by flashing their way through this first obstacle. America’s Nathaniel Coleman (somewhat surprisingly, seeing that in the semis he placed second) needs 4 attempts to unravel the problem. So at present 4 are in the lead. But this is only the start, there’s no need to worry too much at this stage. Especially since problem #2 proves to cause issues to everyone, or almost everyone. Pelorson sends it 3rd go. While Chon demonstrates why he’s the current world #1 by flashing easily flashing this “pull-up” sequence. On problem #3 Tomoa Narasaki makes his move and leaves a mark, he certainly doesn’t want to be left behind and tops out second go. Skorodumov fails. While Peharc, Pelorson and Coleman flash this boulder. Chon for his part shows the first signs of tiring (so to speak) by sending this problem 3rd go and, in doing so, giving Pelorson a glimmer of hope who promptly draws level. Then, on the final and decisive problem all seem unleashed. Narasaki, followed by Skorodumov, Peharc, and Pelorson all send it first go. Only Coleman requires 4 attempts 4. So when it’s Chon’s turn everyone knows he has just one chance for victory: he needs to top out first go! And top out first go is exactly what he does. 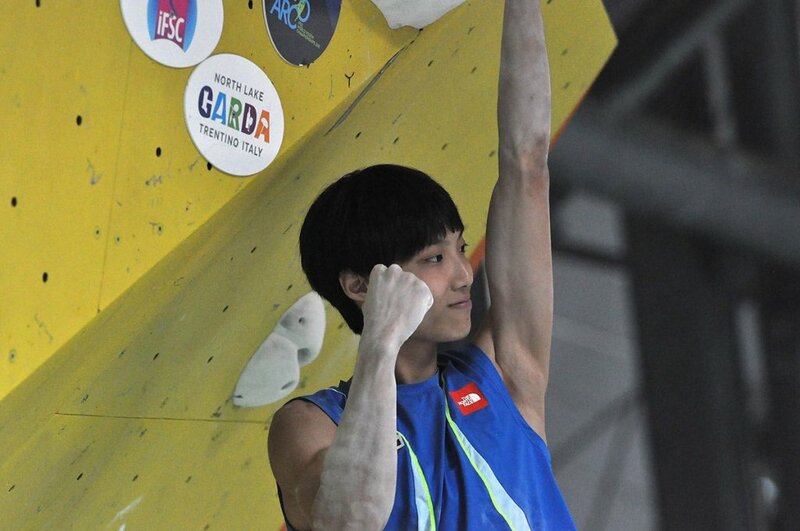 So South Korea’ Jongwon Chon is the first Juniors Boulder World Champion, thanks to his score of 4 tops in 6 attempts. France’s Nicolas Pelorson takes silver, split by just one attempt more than Chon, while bronze goes (with 3 tops in 3 attempts) to Slovenia’s Anze Peharc who beats Japan’s Tomoa Narasaki by the narrowest of margins – read one attempt less to reach a bonus zone. Yes, this comp really did go down to the wire!